Welcome to the Cooking With Cricut Bunny Hop! With Easter just around the corner we wanted to share some of our ideas and give you some inspiration for your Easter projects! If you've come from Stacey's at Stacey's Creative Corner, you're in the right place! If you've just happened across my blog and would like to hop along with us, you can go to Cooking With Cricut and start at the beginning. Now it's your turn! 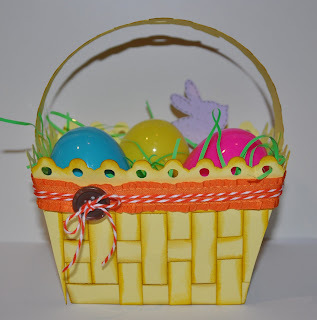 Link up your Easter-related project at Cooking With Cricut - be sure to include a Cricut or other die cut machine cut on your project. The Design Team will pick their three favorites and one lucky person will be chosen randomly to win one of the prize packages being offered in this hop. oh wow such a cute vasket... I love it. I LOVE the woven look!!!! Such a great basket! I love how you did the weaving! Your basket turned out too cute! I love the dimension that the inking gives, it turned out so nicely! This is so cute! I'm sad that I missed out on that cart! TFS! Beautiful! Love all the details! TFS! Cute basket Roberta. Thanks for sharing...love this blog hop! Great basket. The weaving is the perfect touch! This is just precious! And I love the little button and twine you added. Thanks for a fun blog hop. What a great Basket!! I Woud be a proud Puppy to tell were I got the insperation from! Great idea to modify by basket weaving, looks awesome. Love the inking on the edges. Have a great Easter hon. This is the first time I have seen a project like this. It is amazing! I love it. So creative. Great job:) TFS! omg roberta, that weaving MAKES the basket!!!! super fun! OK since I cannot find this cart anywhere!! Do you know of any cart that would have a basket in this style?? I love it and I think taking the strips and inking then weaving them really makes it outstanding!! I like the detail the inking gives it. Love the basket, Roberta! The inked edges gives it almost an antique-y feel. The baker's twine and button are a nice touch! Love your basket. You're so talented. Thanks for sharing. Very cute. I like the extra touch of the striped string. I love the way you made the basket! I will be making one soon and you have helped me visualize how to do it. Thanks so much! Great idea to weave the strips! 3D is definitely the way to go with a basket! Sweet! TFS! So cute! When I first looked at it I thought that it was a real basket! Great job! Cute Easter basket! Love the brightness of the colours together. I love the shading and how you took this project to the next level. Beautiful!! TFS really cute basket. Didn't know it was on that cartridge. what a pretty basket. Thanks for joining us for the FCCB Spring Crawl this week. I just love this basket! So cute! Thanks for joining us this week at FCCB! Nice job on the basket. Thanks for playing at FCCB. Such a cute basket - love the added weaving. Thanks for crawling with us at FCCB. Great job...I love the weaving! Thanks for playing along with us at FCCB this week!